Just because Bank of America’s shares have surged since the presidential election doesn’t mean that they're now unreasonably expensive. Host of CNBC's Mad Money, Jim Cramer. Image source: Wikimedia Commons. CNBC host Jim Cramer certainly has his detractors, but I've found that a lot of his opinions tend to coincide with mine. His position on Bank of America (NYSE:BAC) offers a case in point. In an article this week, Cramer asked one of the most important questions facing prospective investors in Bank of America right now: Given the rapid ascent of its stock in the wake of the presidential election, is it too late to buy the bank's shares? Cramer doesn't think it is for two reasons. First, he believes that interest rates could soon rise in a series of multiple rate hikes by the Federal Reserve. And second, the incoming Trump administration's promises to roll back the suffocating regulatory regime under the Dodd-Frank Act will reduce compliance costs for Bank of America and thereby boost its bottom line. I think the answer is that if you believe there are going to be multiple rate hikes, like I do, you wait to see if it gets back to $18, but that you accept that you may end up paying $20 because in this new regime I just don't think the buyers will let it go back to $16. I think Cramer is absolutely right. Fed chairwoman Janet Yellen said as much in testimony to Congress this week, praising the ongoing improvement in employment, inflation, and the economy more generally. The central bank's monetary policy committee thus concluded at its latest meeting that "the case for an increase in [the Fed Funds rate] had continued to strengthen and that such an increase could well become appropriate relatively soon." Traders have already sent long-term interest rates surging in anticipation of such a move. 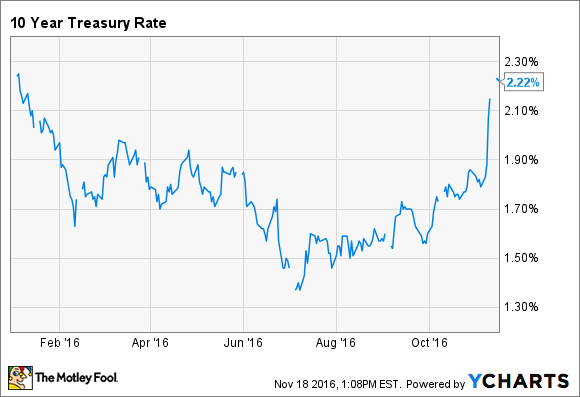 The yield on 10-year Treasury bonds climbed from around 1.8% at the time of the election to over 2.2% today. That's a huge move given the size of the market for 10-year Treasuries. It's also music to the ears of Bank of America, which stands to earn billions in additional net interest income as rates rise. Additionally, if Trump follows through on his promise to cut taxes and boost spending on infrastructure projects, as well as to reduce regulations, then banks would be free to make a lot more loans. "We could lend more money if the capital levels were different," Bank of America chairman and CEO Brian Moynihan said earlier this year at a conference organized by The Wall Street Journal. The annual stress tests mandated by Dodd-Frank are a drag, as well, he said. "It will make you very safe," Moynihan said of the tests. "The question is whether it restricts lending." The answer to that question is clearly yes. Not only do the stress test and capital requirements mean that banks have to keep more capital on their books as opposed to investing it in interest-earning assets, but the rules also dictate how banks allocate their assets between highly liquid securities and illiquid loans -- showing a clear preference for the former. At the end of the third quarter, which concluded on Sept. 30, Bank of America had $522 billion worth of so-called global liquidity sources -- namely cash and low yielding government securities. If it were able to reallocate a portion of that into higher yielding loans, it would stimulate both the economy and Bank of America's bottom line. Based on very rough math, for every $100 billion the bank cycled into loans, it'd earn $550 million or so in added net interest income a quarter, which would boost its earnings by upwards of 10%. It's also worth noting that Trump's reform agenda could very well remove the Fed's veto power over bank capital plans. Combined with higher earnings, that would free Bank of America up to double its quarterly dividend while still paying out a comparable share of its earnings to shareholders relative to banks such as JPMorgan Chase and Wells Fargo. Finally, even though Bank of America's shares have surged 18% since the presidential election, and are thus nowhere near as cheap as they were beforehand, they're still a far cry from expensive. They trade for a 17% discount to book value per share and an only 14% premium to its tangible book value per share. These are very reasonable valuations. The point being, just like Cramer says, if you're on the fence about buying Bank of America stock, your primary concern shouldn't be its price/valuation. Yes, its shares are more expensive than they were two weeks ago. But no, that doesn't mean that they don't have room to grow from here.